Ever since the world found out that Kate Middleton was going to marry Prince William, her fashion choices have been a fixture in the media. 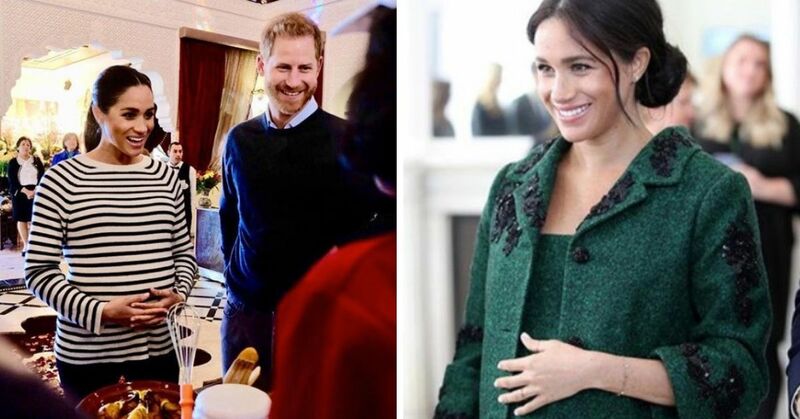 From her royal engagement dress to her royal tour outfits, and her pregnancy style, nothing goes unnoticed. While the Duchess of Cambridge's style has evolved over the years, there are still certain aspects of it that has remained the same. 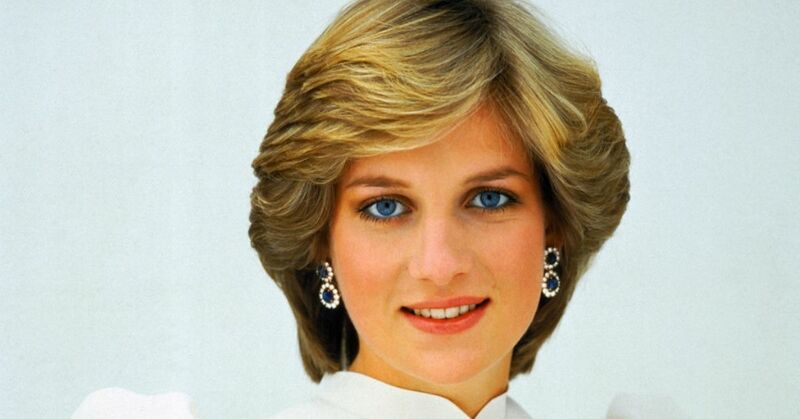 Especially her subtle tributes to William's mother, Princess Diana. The royal often takes fashion cues from the late Princess of Wales, and it always seems to pay off. 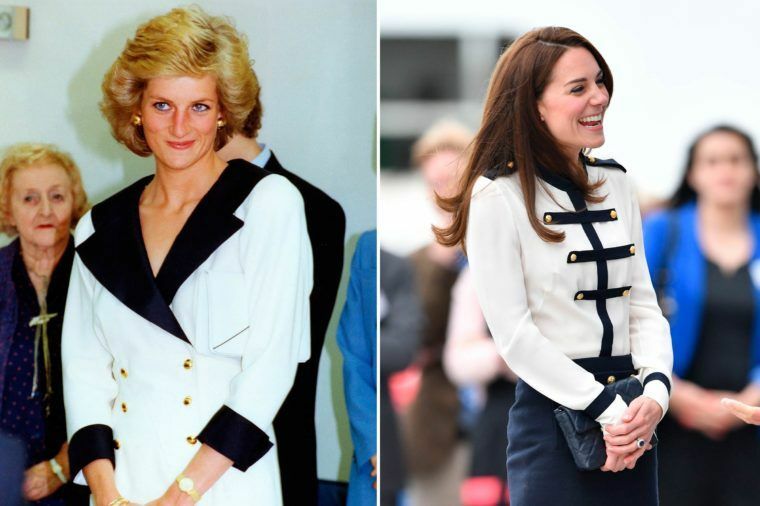 Here are 20 instances in which Kate basically wore the same outfits as Diana. The Duchess of Cambridge wore a baby blue and white Jenny Pakham dress to show off her firstborn, Prince George, a few hours after his birth. 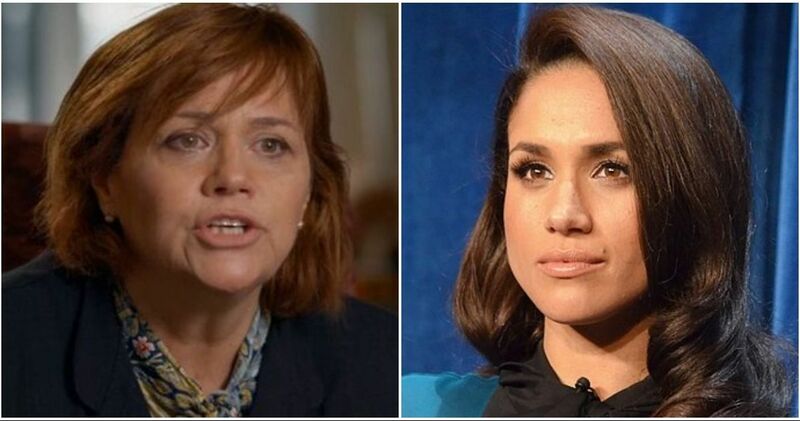 People were very quick to draw comparisons to the outfit her late mother-in-law wore more than three decades ago when Prince William was born. Diana loved to ski, so she and her family would often go on skiing holidays. 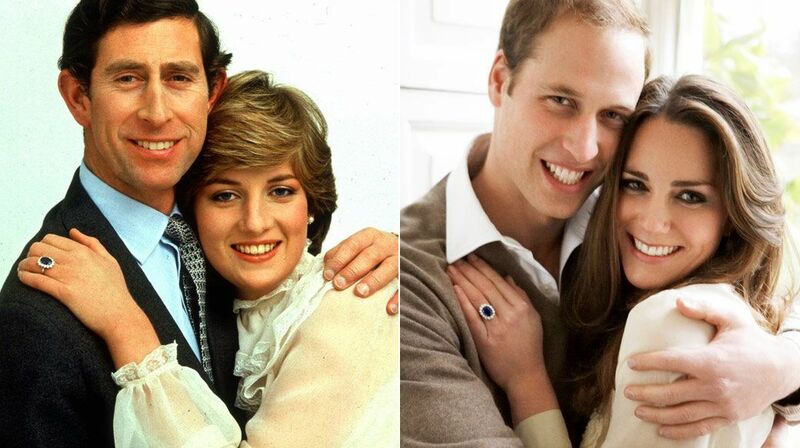 Now, Prince William and Kate are continuing that tradition with their young family. 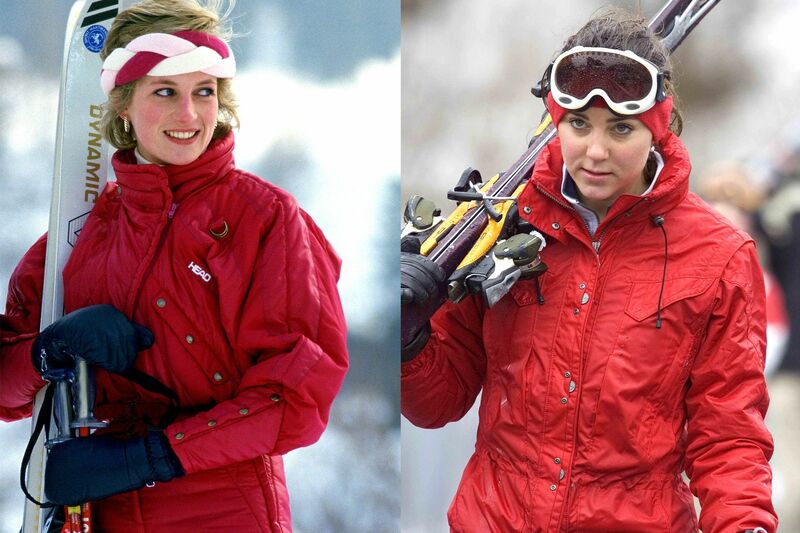 During one of their trips to Switzerland in 2005, Kate donned a red jacket that mirrored the outfit Diana wore while also skiing in Switzerland in 1986. Like Diana, Kate has a good grasp of how to dress for any occasion. Even on the most somber of days, both women looked incredibly stylish without being over the top. 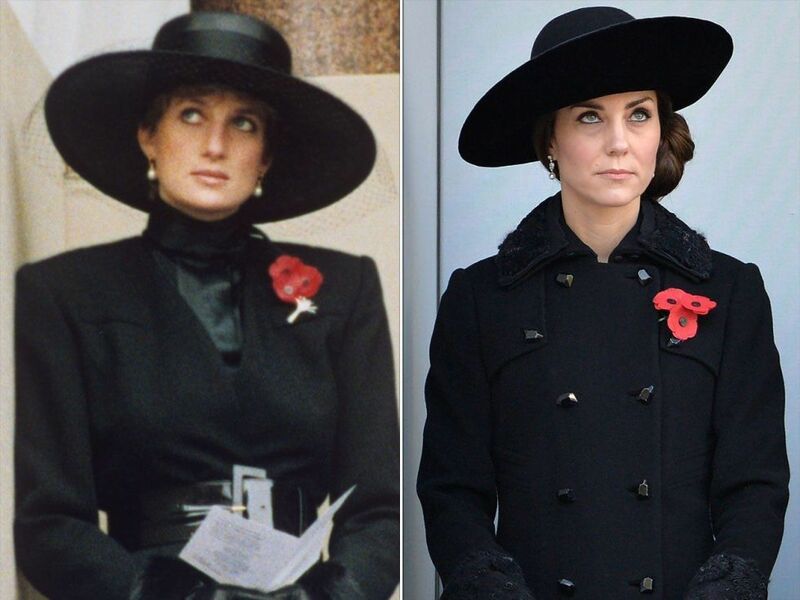 For Remembrance Day Service in 2016, Kate wore an all-black outfit with a wide-brimmed hat, pearl drop earrings, and three poppy pins, just like Diana did for the same occasion back in 1991. 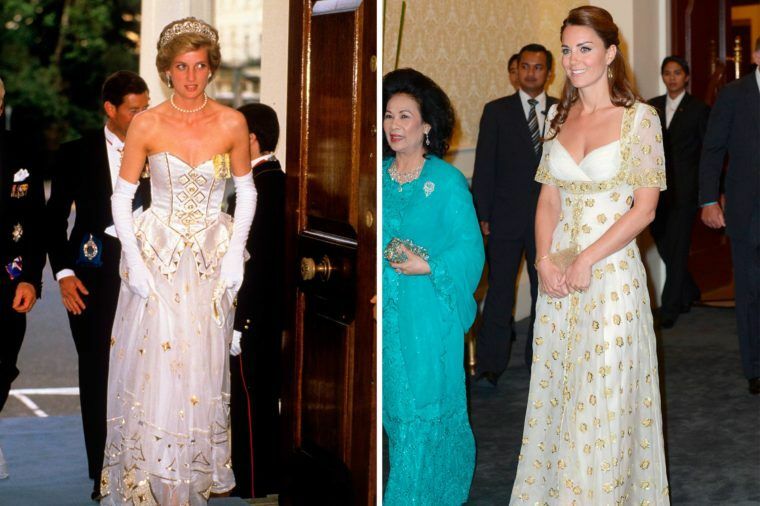 There's no denying that Kate had Diana in mind when she chose to wear this elegant ivory and gold dress for an official dinner in Kuala Lumpur, Malaysia during the Diamond Jubilee Tour in 2012. Diana wore a similar dress back in 1986 to attend a black tie dinner held at the German Embassy in London. Like the Queen, Diana always incorporated bright hues into her style so her practical outfits would appear cheerful. Now, Kate is taking a page out of Diana's book when it comes to wearing vibrant ensembles for her daytime engagements. 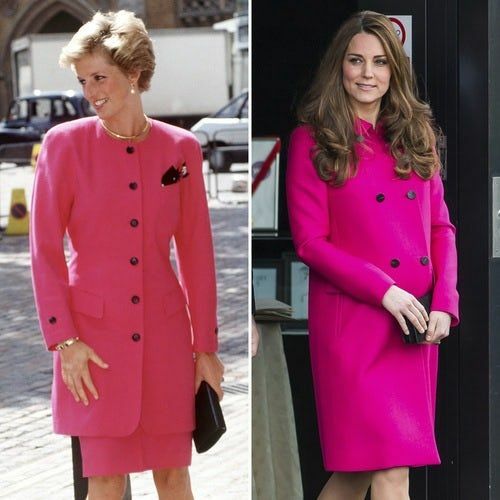 For instance, the coat she wore to visit the Stephen Lawrence Center in 2015 is reminiscent of the pink coat Diana wore to the Abbeyfield Society annual general meeting in 1990. 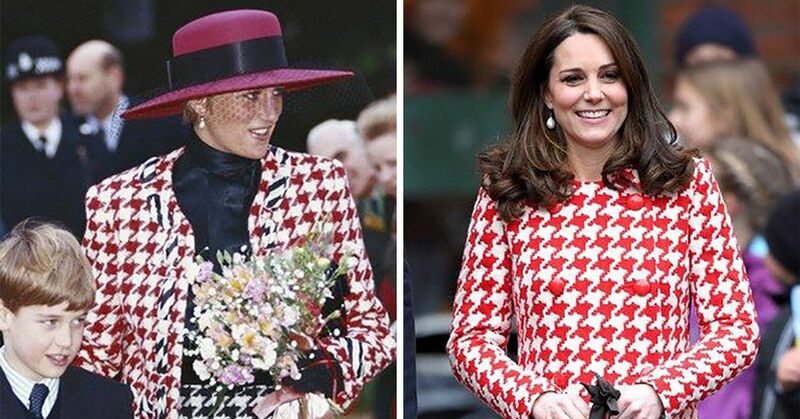 Diana wasn't one to shy away from bold patterns, and it looks like Kate is the same. The Duchess has previously stunned in patterned outerwear and dresses, but she turned even more heads on the second day of her royal tour of Scandinavia. 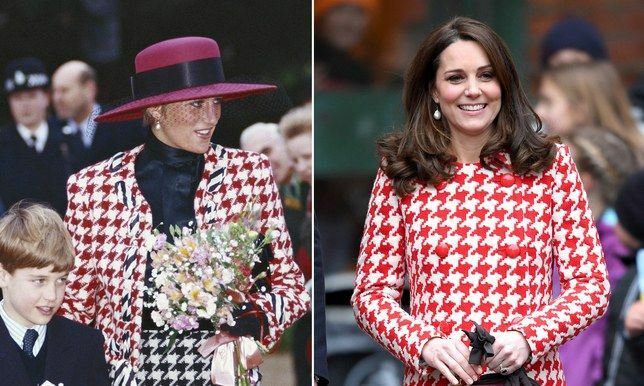 While in in Stockholm, Sweden, Kate showed up in a red Catherine Walker houndstooth coat, which looked very similar to the patterned suit by Moschino Diana wore back in 1990. 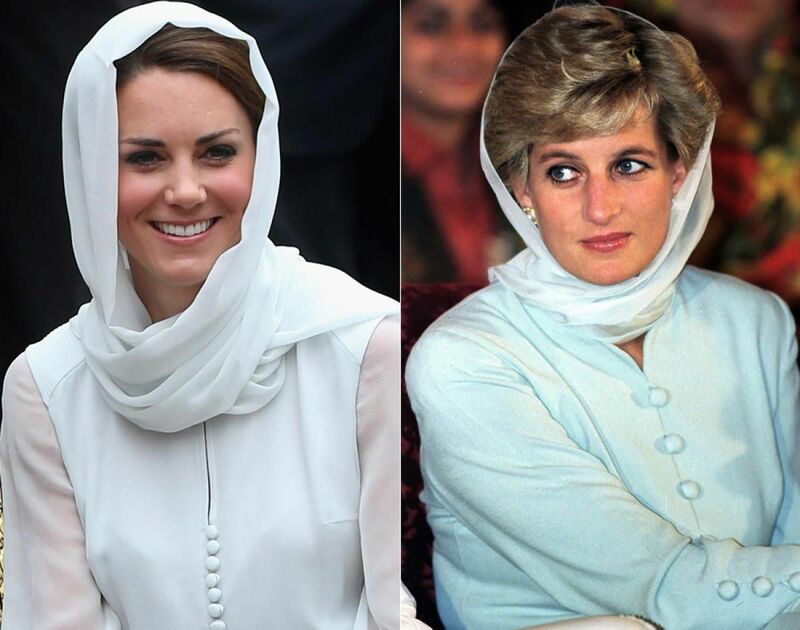 Kate's ensemble during her 2012 royal tour stop at the Assyaskirin Mosque in Malaysia was strikingly similar to Diana's 1996 Pakistani-inspired outfit and light head scarf. August 30, 2017 was the 20th anniversary of Diana's death, and Kate fittingly wore a floral Prada dress inspired by her late mother-in-law for the walk through the all-white garden created in her memory. 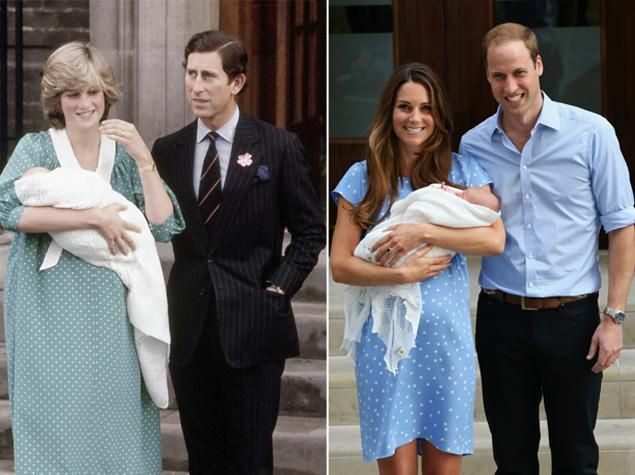 The colors are not the same, but the pattern and cut of Kate's dress instantly reminded us of the frock Diana wore for her rehearsal dinner at St. Paul's Cathedral in 1981. There's so much about Kate's New Zealand tour debut outfit that gives a nod to past royals, including Princess Diana, of course. 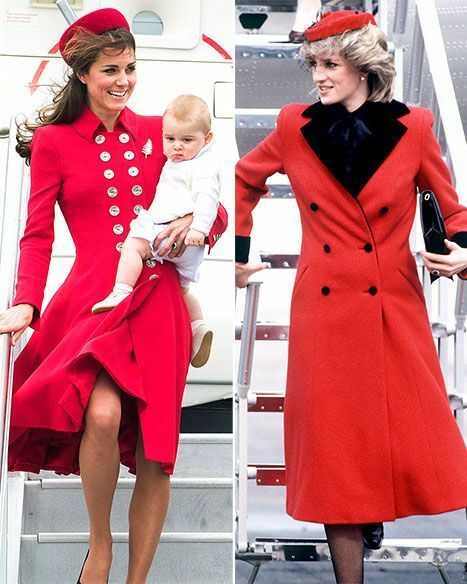 Just like Diana did while arriving in the same country back in 1984, Kate wore a bright red Catherine Walker double-breasted coat with a matching pillbox hat and black pumps. 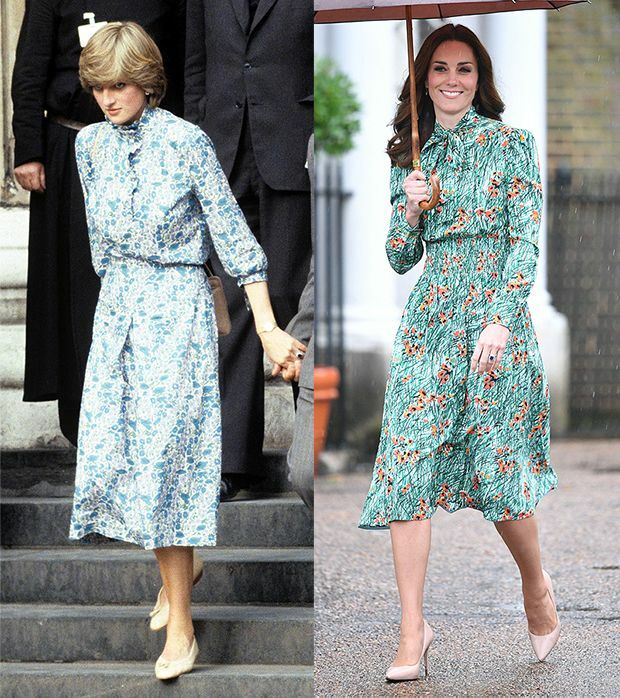 Diana was a fan of the designer, so we're sure Kate chose this outfit on purpose. While Diana opted for a clutch to complete her look, Kate's accessory of choice was a diamond and silver fern brooch on loan from the Queen's collection. 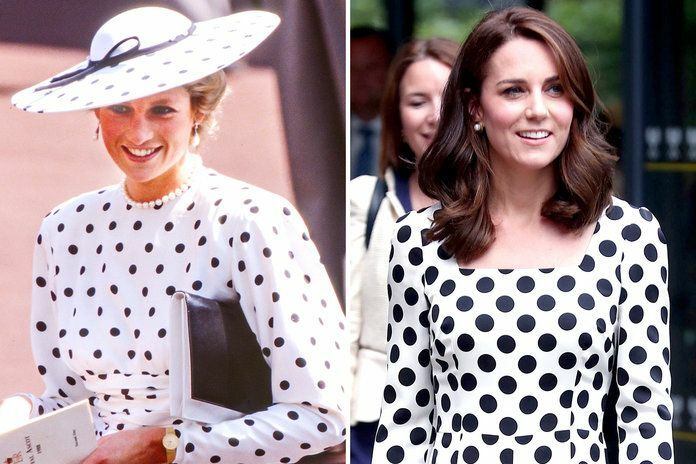 Kate brought Diana's 1988 Ascot polka-dot look into the 21st century when she wore a similar dress knee-length, minus the hat, to a Wimbledon tennis match in 2017. Kate also donned a similar black and white polka-dot dress to visit the Warner Brothers studio in 2013. 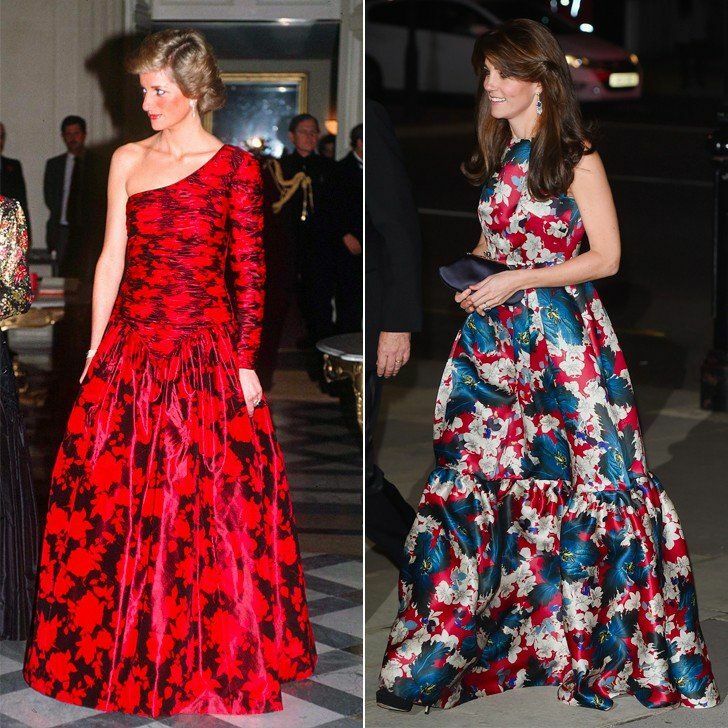 Both princesses have a penchant for taking fashion risks, so many weren't surprised to see Kate attend a charity gala in London in 2015 wearing a floor-sweeping gown with a very bold print. However, people were taken aback by how much the Duchess's outfit struck a similar note to the big dress Diana wore for a charity event in Paris in 1988. In 2016, for her first-ever solo trip overseas, Kate stepped out in a powerful yet elegant powder blue peplum suit. 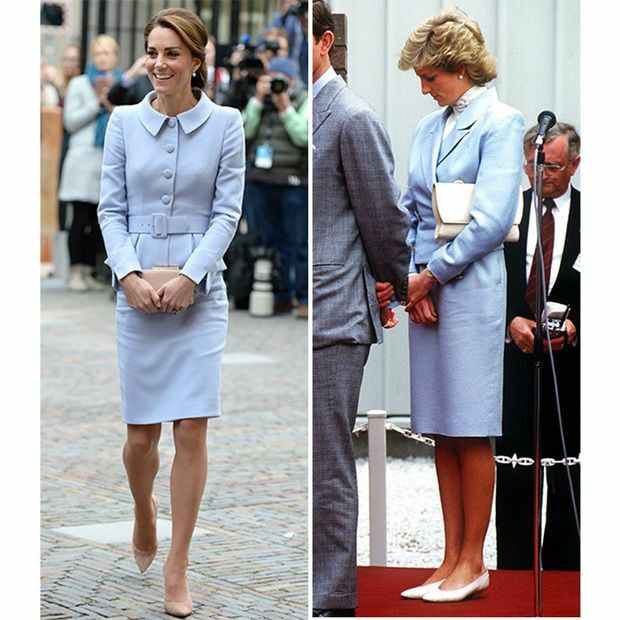 While some reports claimed she was influenced by Jackie O, many others were convinced that the Duchess was inspired by a similar skirt suit Diana wore back in 1988. Like Diana did in 1981, Kate also wore blue for her first public appearance after her engagement to William was announced. 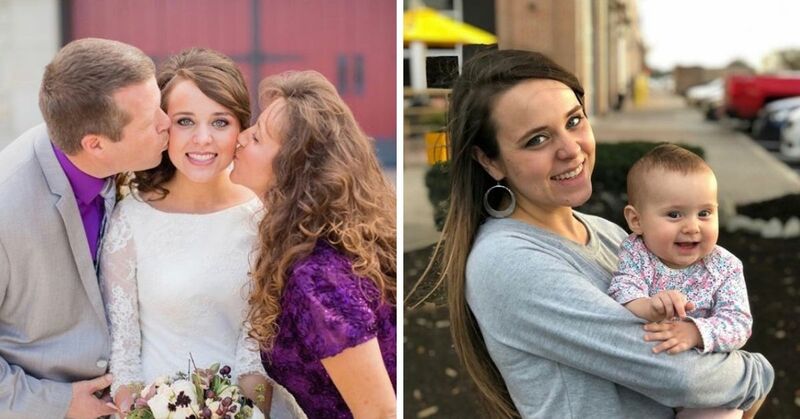 Then she once again channeled her mother-in-law when posing for official engagement portraits. In addition to wearing the same 18-carat diamond and sapphire ring as Diana, Kate also donned a similar colored outfit. Little girls aren't the only ones who can get away with wearing pink from head to toe. 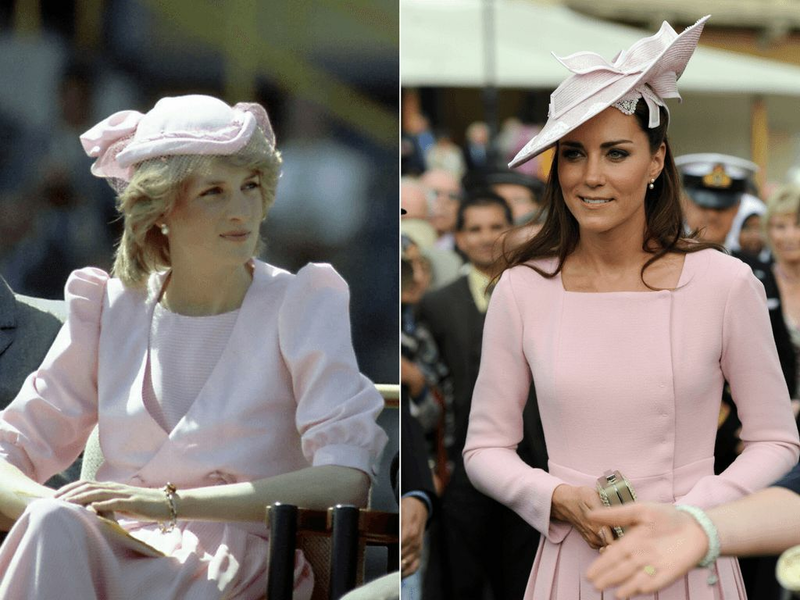 Both Diana and Kate looked elegant and feminine in millennial pink getups before the color became trendy. The Princess of Wales wore her pastel pink outfit during the Royal Tour of Italy in 1985, while Kate showed off hers at a garden party at Buckingham Palace in 2012 in celebration of the Queen's Diamond Jubilee. They both paired their pleated outfits with matching hats. In 1997, Diana wore a simple yet chic white suit to meet with Mother Theresa in New York City. 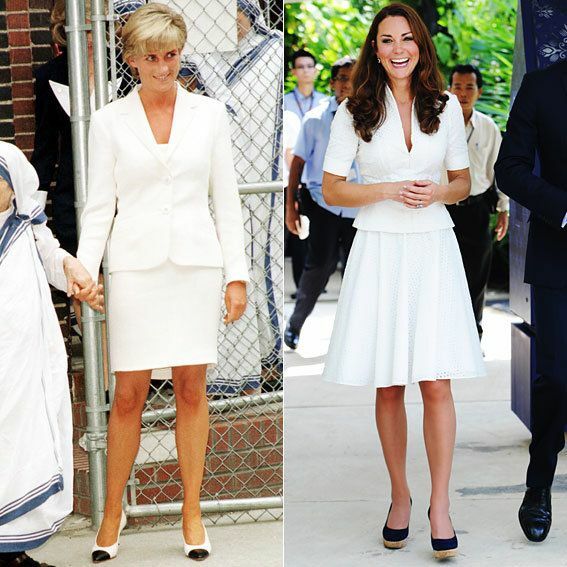 Kate replicated the all white outfit with a more casual twist during her visit to Singapore in 2012. Diana rocked a black and white coat with gold buttons when she accepted a charity donation from All Nippon Airways and Takashimaya department store in 1989. In 2016, Kate wore a similar nautical-inspired Alexander McQueen outfit to visit the Land Rover BAR headquarters. 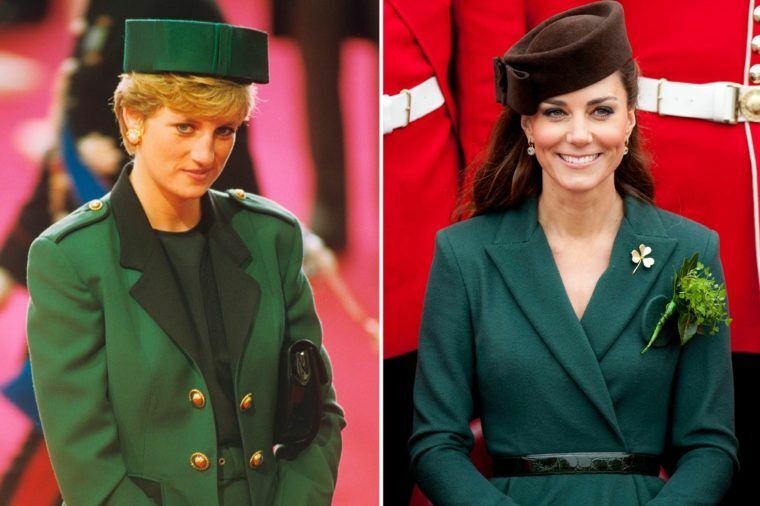 Kate took a style cue from Diana when she wore a green dress coat and pillowbox hat to the 2012 ceremony honoring the Irish Guards. 22 years prior, Diana wore a similar look for the Italian state visit to London. 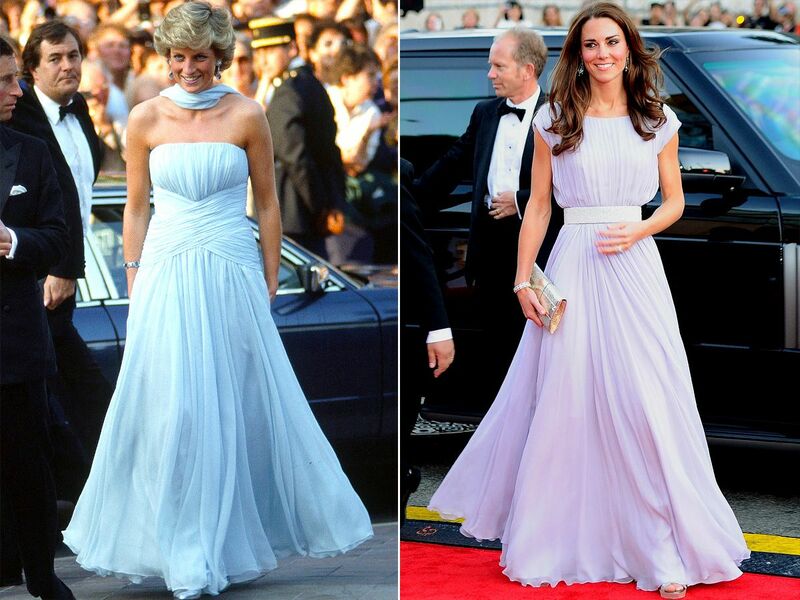 The colors are definitely not even close, but the the fabric, flow, and rushing of the dress Kate wore to the 2011 BAFTA Awards in Los Angeles was reminiscent of the chiffon dress Diana wore to the Cannes Film Festival in 1987. 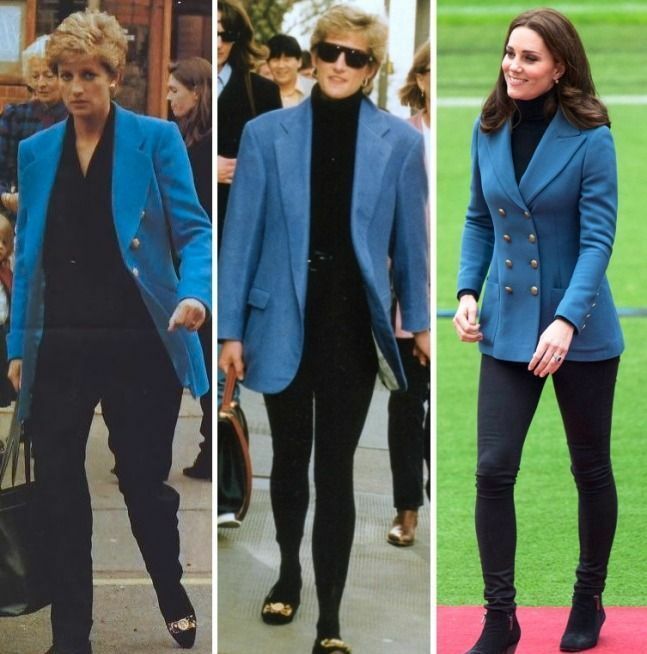 Kate echoed Diana's 90s blue blazer ensembles at a 2017 event to honor graduates of the sports program Coach Core. Kate updated the look by wearing a tailored double-breasted jacket with a black turtleneck top, skinny jeans and ankle boots. 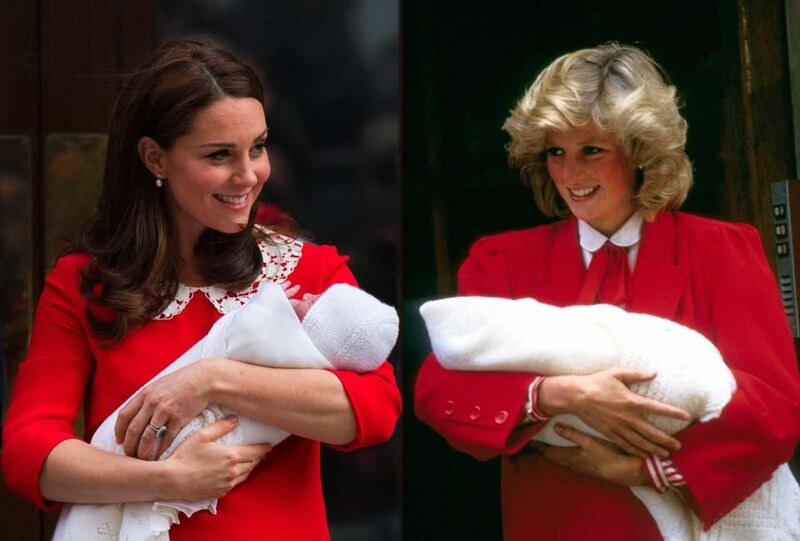 After Prince Louis's birth on April 23, 2018, Kate once again stood in the same spot outside the Lindo Wing and paid homage to Diana. 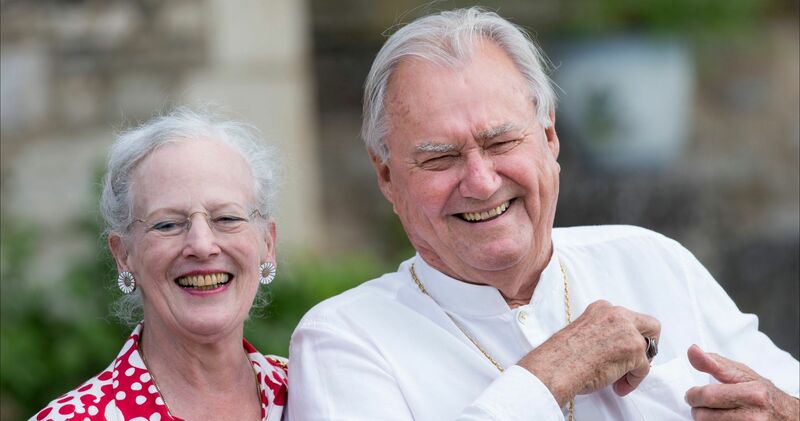 She wore a red dress with a white peter pan collar similar to the one the late princess wore during her first public appearance after giving birth to Prince Harry. 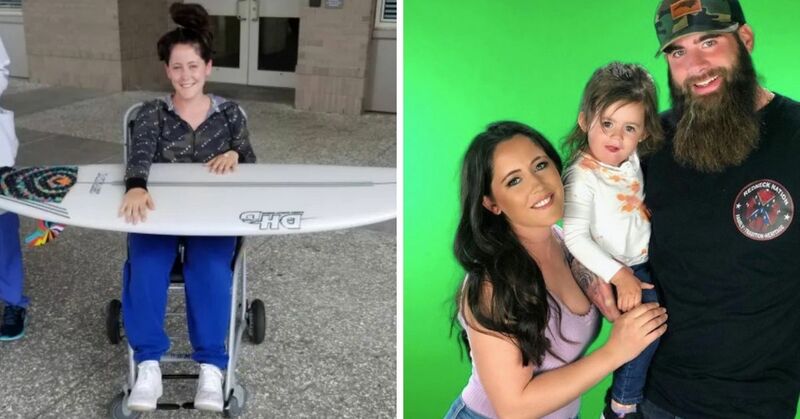 Which outfit is your favorite? Let us know in the comments!